Please note that due to currency fluctuations and a manufacturer price increase, we can no longer absorb this cost so have been forced to increase the price of the popular SG PEN to $700 + GST. The good news is there is still time to purchase at the old price - we will hold the current price of $610+GST until 26th April 2019 so purchase now to beat the price rise. We regret this unavoidable increase and trust you understand. 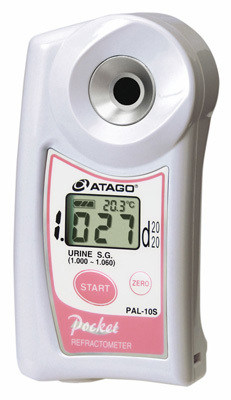 The Pocket PAL is an easy to use, intuitive to operate and ergonomic Urine refractometer. It fits into the palm of your hand and is designed to ensure hygiene is easily maintained - these units are designed to be completely washable with an IP65 rating - this rating means it is also very dust resistant. By reducing the number of unnecessary parts, the manufacturer has reduced the risks of germ reproduction. The new PAL series has been approved by the HACCP, and is equipped with the new ELI feature, which ensures accurate measurements - even outdoors. Water & Dust resistant (IP65). Can be washed under running water. Will float if accidentally dropped in water. The innovative design makes it easy to pour out and remove a sample, but difficult to spill the sample. When intense light penetrates the prism of a digital refractometer, the light waves interfere with the sensor, which may lead to inaccurate measurements. To ensure accurate measurement results, the PAL is programmed with the ELI function which displays the [nnn] warning message when intense direct light is detected. Forming a habit of shading the sample stage with your hand and re-pressing the START key (when the warning message from the ELI function is displayed) will ensure accurate measurement results each time. PAL series comes with Data Transmission Function with NFC technology to enable you to download the last 100 test results.